Pumpkins and apples. Scarecrows and hayrides. 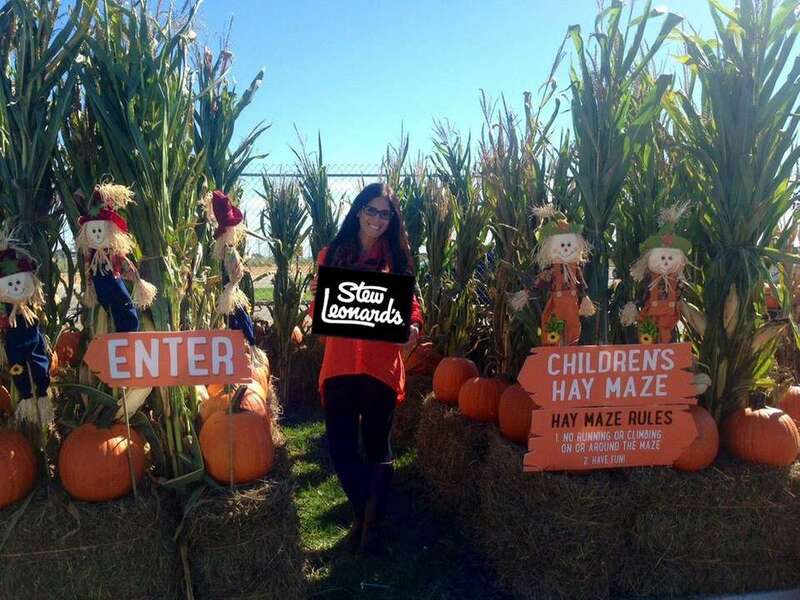 Corn mazes and haunted houses. 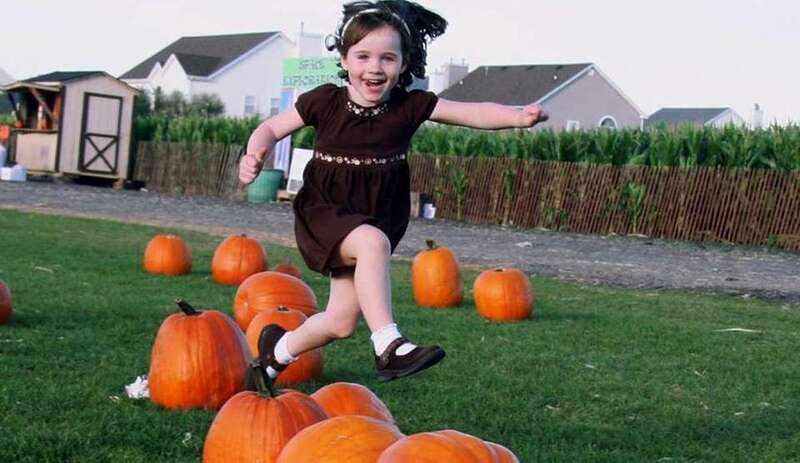 It can only mean one thing -- fall fun is awaiting Long Island families. 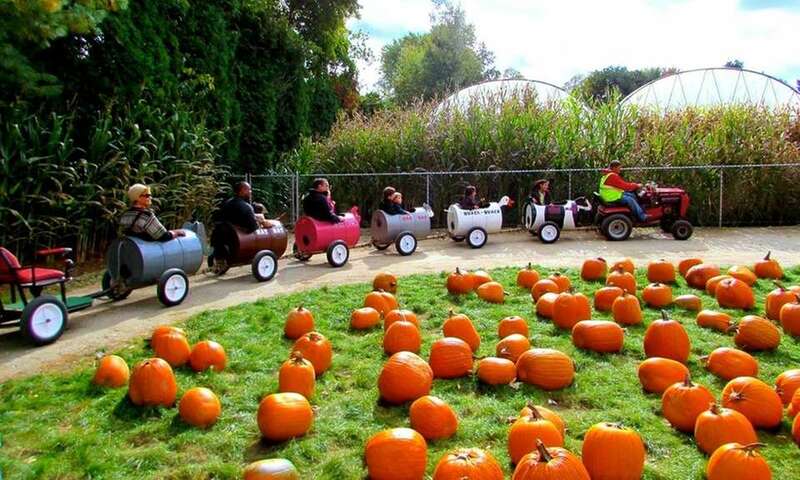 To help you make the most of the season, we've rounded up the can't-miss fall activities for families on Long Island. Take a look. From hayrides and petting zoos, to pumpkin-picking and carnival games, there are many family festivals in September and October. Some of the upcoming festivals: The Long Island Fair, Apple Festival, Oyster Festival, Halloween fairs and more. 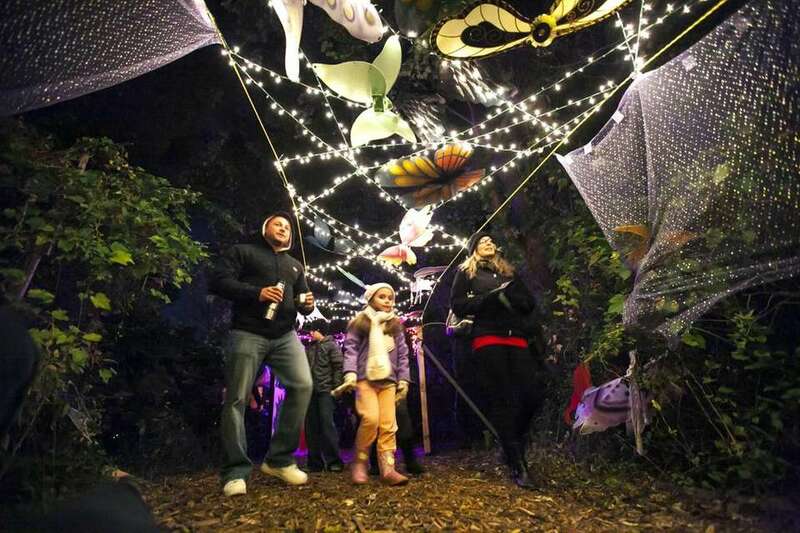 To find the complete list, check out our family fall festivals guide. The Rise of the Jack O'Lanterns at Old Westbury Gardens (71 Old Westbury Rd.) in Old Westbury lights up the night in October. 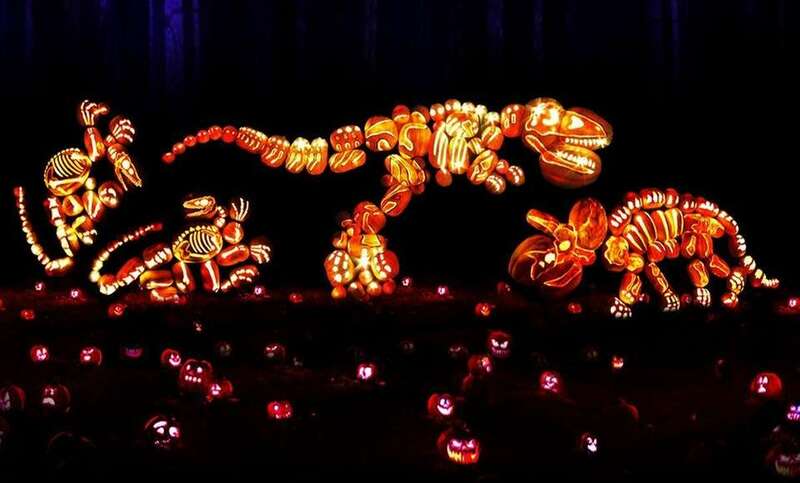 The exhibit features more than 5,000 hand-carved jack-o'-lanterns created by professional artists and sculptors on display throughout a 1/3-mile trail. Watch for a rumble between a skeleton biker gang and their off-road riding rivals, as well as a trio of talking jack o'lanterns. The event takes place Oct. 5-7, 12-14, 18-21 and 25-29; $26 adults, $22 children ages 3-17, free children two and younger; advanced tickets are required; therise.org. 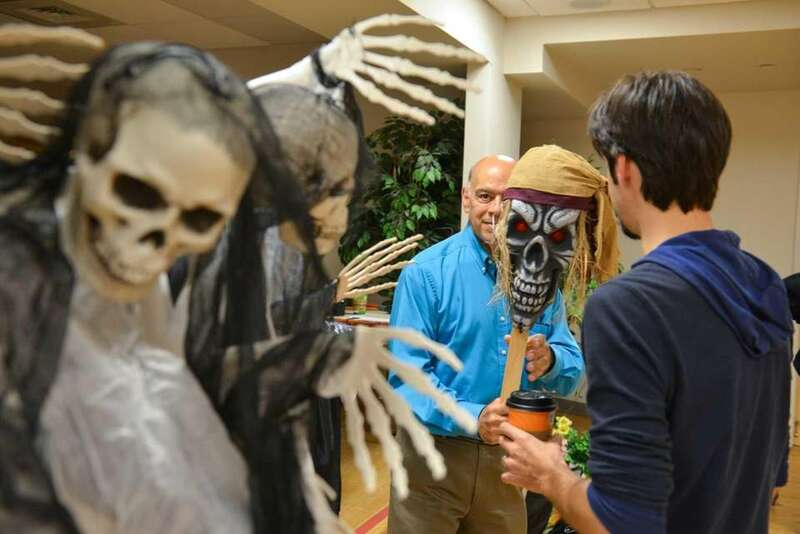 On Saturday, Oct. 27, from 6 to 9 p.m., the Long Island Children's Museum (11 Davis Ave.) in Garden City will be hosting a "Ghostly Gala." Show off your costume, decorate a goody bag, trick-or-treat, get your face painted, make spooky crafts and more. In addition, bubble master Jeff Boyer will perform a "Bubble Trouble" performance sculpting and juggling the soapy spheres (at 6:15 p.m., 7 p.m., 7:45 p.m., 8:30 p.m.). Price: to be announced, bubble show is an additional $4, $3 for members; advanced ticket purchases recommended; licm.org. At Clark Botanic Garden in Albertson, a Not-So-Spooky Walk for families will take place on Sunday, Oct. 28 from noon to 4 p.m. There will also be face painting, pumpkin decorating and more. On Friday, Oct 26 and Saturday, Oct. 27 from 6:30-9:30 p.m., there will be a Spooky Walk, featuring horror villains like Michael Meyers, Freddy Krueger, Jason, Ghostface and more. Price: $5 per person, cash only. The 2018 Child Safe Halloween at the American Airpower Museum (1230 New Highway, Farmingdale) kicks off on Sunday, Oct. 28 from 10 a.m. to 5 p.m. 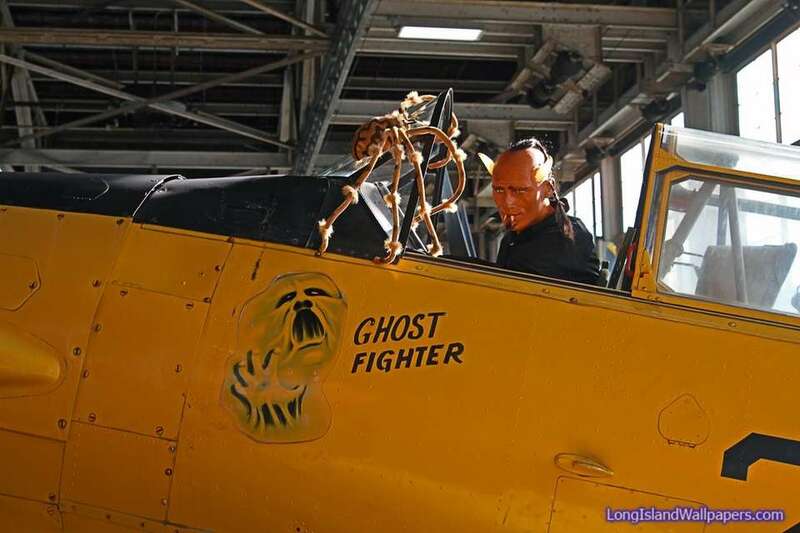 Kids can trick-or-treat in the haunted hangar, scavenger hunt, best costume contest (kids ages 12 and younger), tour the haunted bomber, crafts, games with prizes, face painting, a ride on the Travesty Tram and more. Price: $12 adults, $10 seniors and veterans, $7 children ages 5-12. For more information, visit americanairpowermuseum.org. A Kooky Spooky Halloween at Theatre Three (412 Main St., Port Jefferson) is a musical about a ghost who is afraid of the dark and is forced to leave his haunted home on a quest with his new friends. The show takes place on Oct. 6, 13, 20, 27 at 11 a.m. and Oct. 21 at 3 p.m. There will be a sensory-sensitive performance on Oct. 14 at 11 a.m. Price: $10; theatrethree.com. Stew Leonard's East Meadow (1897 Front St.) and Farmingdale (261 Airport Plaza) stores are hosting Halloween Happenings through the month of October. Events in both stores include: A pumpkin patch everyday in October. On Tuesday, Oct. 23 from 4 to 5 p.m., children are invited to dress in costumes and go trick-or-treating throughout the store. Children can pick up a map from Customer Service and use the map to find treats. Pumpkin carver Lenny Calvin will be at the East Meadow store from 10 a.m. to 4 p.m. on Saturday, Oct. 20 to entertain shoppers with his elaborate Halloween-themed etchings on the store's pumpkins. He will be at the Farmingdale store from 10 a.m. to 4 p.m. on Sunday, Oct. 21. On Wednesday, Oct. 31, children who come to the store in their costumes will receive a free small ice cream. 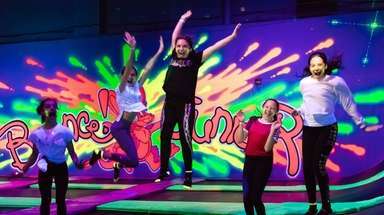 The East Meadow store is also hosting a "Halloween Glow in the Dark" dance party on Friday, Oct. 21 from 6 p.m.-7 p.m. for kids ages 6-12, using a special dance floor and light machine; pizza, snacks and juice will be served ($14.99, parents are $10; register online at eventbrite.com). The Farmingdale store is offering a "Halloween Costume Party" brunch on Saturday, Oct. 27, 2018, with arts and crafts, food, games and an appearance by Wow the Cow. Sessions are at 10 a.m. and at noon (ages 12 and older pay $14.99, 11 and younger $12.99; seating is limited, reserve online at eventbrite.com). The Farmingdale store will also have a free hay maze for kids, which is open every day from 8 a.m. until dark. For more information, call the East Meadow store, 516-394-9001 and the Farmingdale store, 516-962-8210. Starting Sunday, Sept. 30 then Saturdays-Sundays in October (plus Columbus Day, Oct. 8), families can enjoy the Fall Festival at Dees' Nursery (69 Atlantic Ave., Oceanside) from 11 a.m. to 5 p.m. You'll find a pumpkin patch, pony rides, an interactive petting zoo, pumpkin-painting, a children's corn maze and gem mining, as well as a free Spooky Walk. Attractions free except for gem mining, interactive petting zoo and pumpkin painting; deesnursery.com. 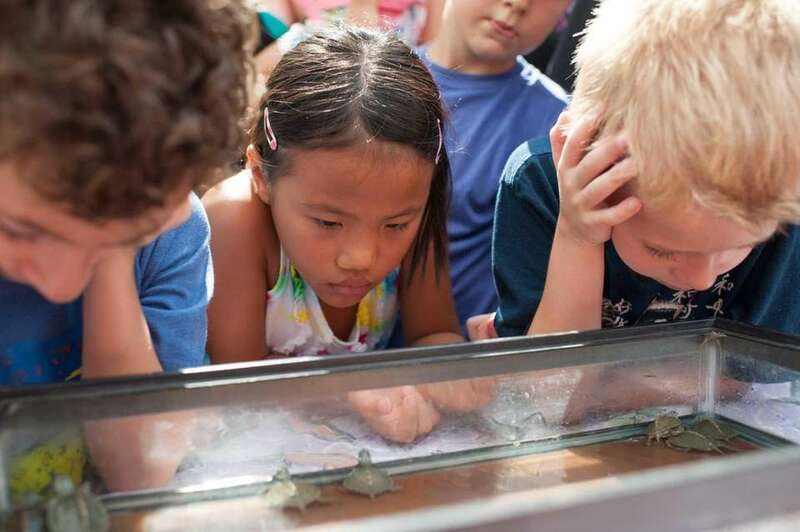 Families are welcome to the Cold Spring Harbor Fish Hatchery and Aquarium's not-so-scary Haunted Hatchery on Saturday, Oct. 27 from 2 to 5 p.m. Young guests can come and trick-or-treat through the facility, while making crafts and enjoying refreshments and game play. 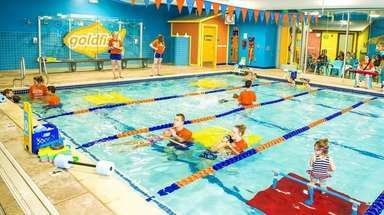 Price is $6 adults, $4 children ages 3 to 12, free ages 2 and younger; cshfha.org. The Long Island Aquarium & Exhibition Center (431 E. Main St.) in Riverhead is hosting a "Bats, Barnacles & Broomsticks" Halloween extravaganza on Saturday, Oct. 27 from 10 a.m. to 4 p.m. Celebrate Halloween Aquarium-style with trick-or-treating, games, music and more. Kids ages 12 and younger in costume will receive half off admission with a paying adult. Price: Aquarium admission is $29.50 adults, $22.50 ages 3 to 12, free children ages two and younger; longislandaquarium.com. Spooky Fest! at the Center for Science Teaching and Learning (1450 Tanglewood Rd., Rockville Centre) features non-spooky activities (a "Not-So-Spooky Walk" in the woods for young children, Halloween Theater, arts and crafts, an "Amazing Animals Live" animal exhibit, "Friendly Merry Monsters," face painting and more on Oct. 13, 19-21, 26-28 at 6:30 p.m.- 9:30 p.m. Price: $10, or $15 when including the scary "Haunted Woods" and "Maze of Zombies" attractions; 516-764-0045, cstl.org. 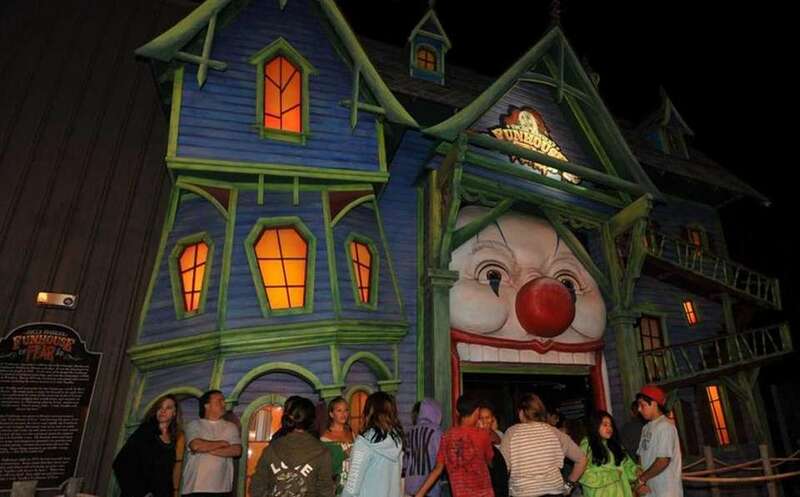 Bayville Scream Park (8 Bayville Ave.) in Bayville is known for its five thrilling attractions for brave tweens, teens and adults, but you may not know that the park also offers kids "Not So Scary" days. Open weekends and Columbus Day through Sunday, Nov. 4 from 11 a.m. to 6 p.m. (also open Wednesday, Sept. 19) , the park feature less-scary versions of the haunted houses with no live actors. 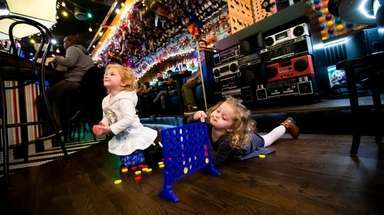 Families can enjoy Uncle Needles Fun House and Mirror Maze, The Temple of Terror, a Pumpkin Bounce, a Halloween Express Train Ride, crafts, a pumpkin patch, Halloween story telling, hermit crab races and more. Price: $24.75 Scream Park only, $31.75 for Scream Park and Adventure Park; bayvillescreampark.com. Pumpkins take over White Post Farms (250 Old Country Rd.) in Melville during their annual Fall Farm Festival. Admission includes pumpkin-picking, multiple bounce houses, exotic bird show, an animal farm (including Patches, the resident giraffe), play-in-the-hay and magic show. The current shows are the "Rodeo Ricky and The Tourist Trap" show and the "Nick's Kids Show." Pony, animal feed and train rides are an additional fee. Info: Weekends starting Sept. 22 through Oct. 28 (including Columbus Day) from 10 a.m. to 4 p.m.; $22.10 plus tax, cash only; whitepostfarms.com. Picking pumpkins isn't the only thing you can do at F&W Schmitt's Family Farms (26 Pinelawn Rd.) in Melville. 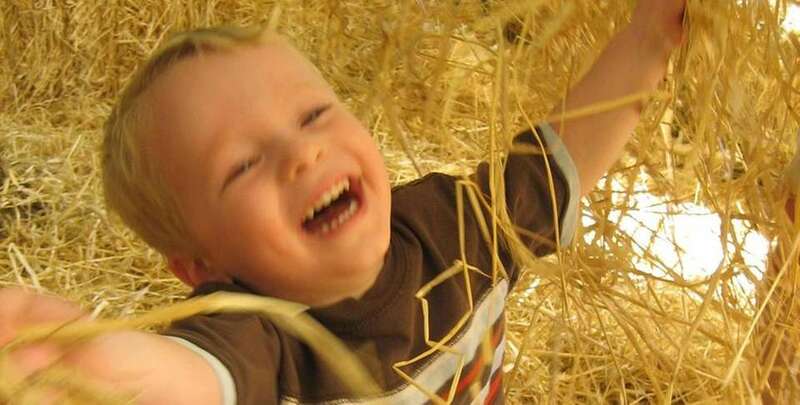 There's a daytime, seven-acre corn maze, with this year's theme "Zombie," free hayrides, straw pyramid, fire truck and treehouse slide, pumpkin patch playground, petting zoo, pony rides and a haunted mansion. Open daily starting Sept. 29, from 10 a.m. to 5 p.m.; free to enter the festival; fee for playground, corn maze and daytime haunted mansion ; schmittfarms.com. The Oyster Festival at Theodore Roosevelt Memorial Park (West End Ave., Oyster Bay) takes place Oct. 13-14 from 11 a.m.-6 p.m. Check out carnival rides, pirate shows, a zoo attraction, a food court, oyster shucking contest, live entertainment, sports clinics and more; rain or shine. Price: Free admission, free parking, POP rides; 516-628-1625; theoysterfestival.org. The Walt Whitman Birthplace State Historic Site (246 Old Walt Whitman Rd., Huntington Station; 631-427-5240) is hosting a Halloween Family Day with "Magic Mike" the magician Sunday, Oct. 21 at 1 p.m. Children can be part of the magic show. There will be a prize for the best costume, face-painting, guided tours of the Walt Whitman Birthplace and more; $9 per child; waltwhitman.org. Spend the day apple-picking at Seven Ponds Orchard (65 Seven Ponds Rd.) in Water Mill. 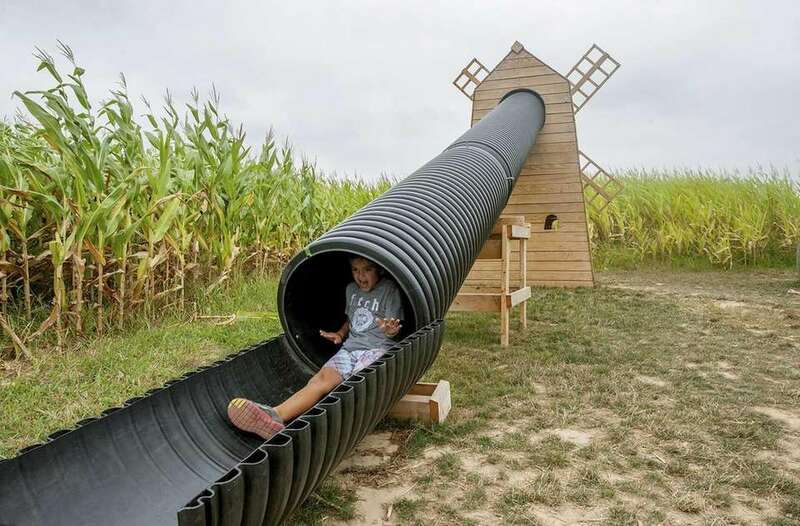 Afterward, check out the corn maze, hay rides and a playground with life-size wooden toys such as a tractor, truck and windmill to climb on, crawl through and slide down--and new for 2018 is the mining station (bags for mining are an additional fee). Plus, there's a farmers market with a bounty of fresh fruit, vegetables, baked goods and more. Guests can also u-pick apples, berries, vegetables and sunflowers. Open daily from 9 a.m. to 6 p.m., $9; 631-726-8015. Looking for gigantic pumpkins? Hanks Pumpkintown (240 Montauk Hwy.) 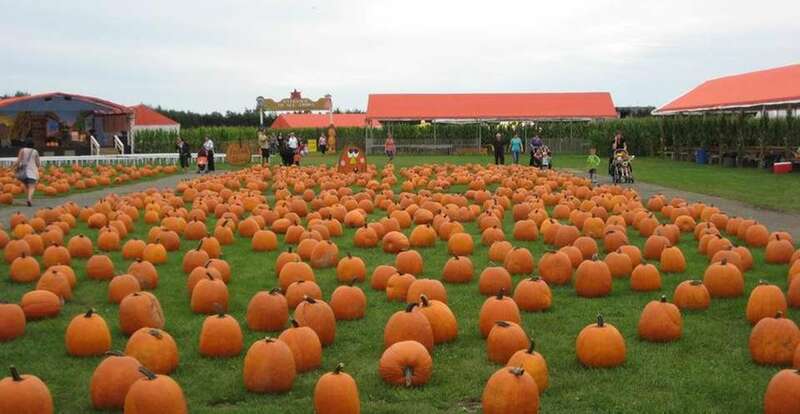 in Water Mill features large pumpkins for picking plus apple picking (Saturday and Sunday), wagon rides, mazes, face painting, gem mining, pedal cars, tractor train rides, rubber duck races, playgrounds, corn swings, giant slide and more. There's also a market including fruits, vegetables, baked goods and roasted corn. There's an hour-long "Farm Scene Treasure Hunt" corn maze, as well as the 15-minute "Spooky Pumpkin" and "Farmer Lynne's Donut" mazes. Open daily Sept. 8-Oct. 31 from 9:30 a.m. to 6 p.m.; Maze Park, weekends only and Columbus Day, $14; hankspumpkintown.com. Frontier Land and Maze at Harbes Western Farm (1223 Main Rd.) 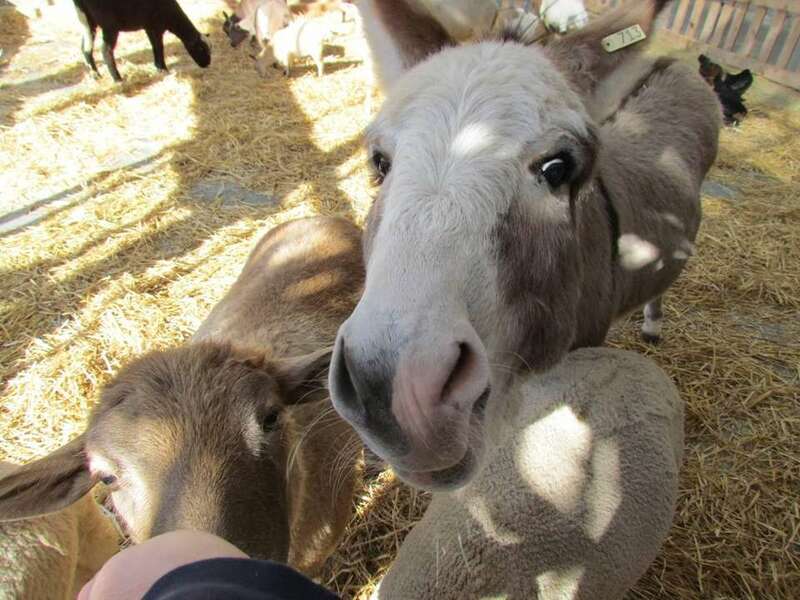 in Jamesport features a variety of fun Western-themed farm adventures for kids. 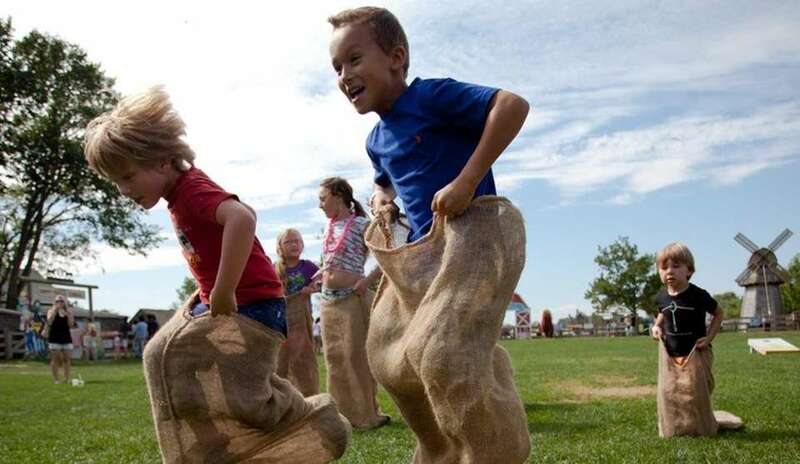 You'll find a pumpkin bounce, petting zoo, a pedal cart where kids can ride around a track, teepee, pony rides, gemstone mining, hayrides, potato sack races, pumpkin tosses, their largest and most interactive corn maze and other games. 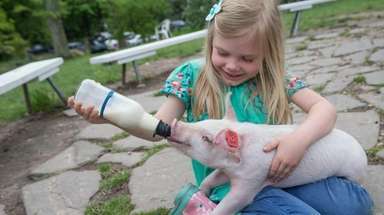 Info: Open daily, from 9 a.m. to 6 p.m., $12.95 per person for hayride, maze and more; $5 pony rides; harbesfamilyfarm.com. 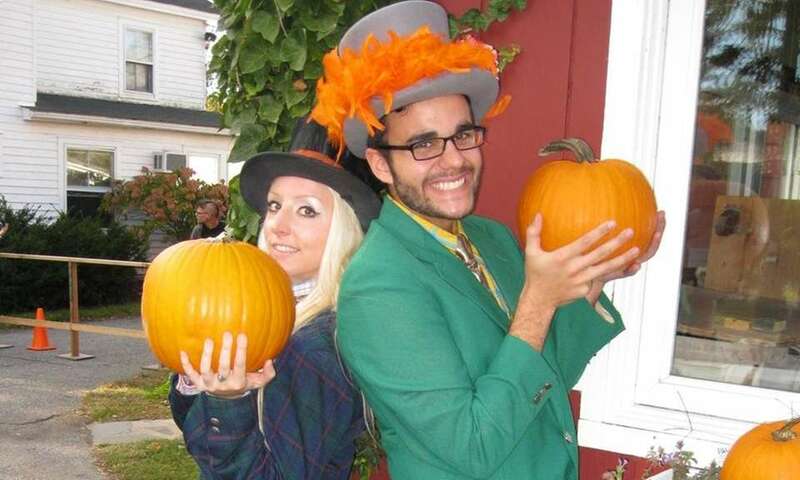 A family-friendly Halloween event at Belmont Lake State Park (Southern State Parkway Exit 38) in North Babylon features trick-or-treating, games, craft-making, a children's spooky den and the sailing of the first 50 carved pumpkins (lit with candles, at dusk) around Belmont Lake on Sunday, Oct. 28 from 3 p.m.-6 p.m. Price: Admission is free; 631-667-5055, parks.ny.gov. Schmitt Family Farm Fall Festival (6 Bagatelle Rd. 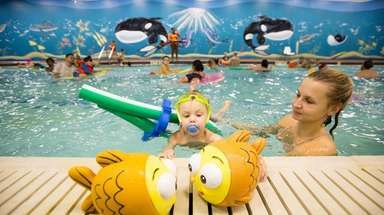 in Dix Hills) takes place on Saturdays and Sundays through Oct. 28 (also open on Columbus Day) from 10 a.m. to 6 p.m. 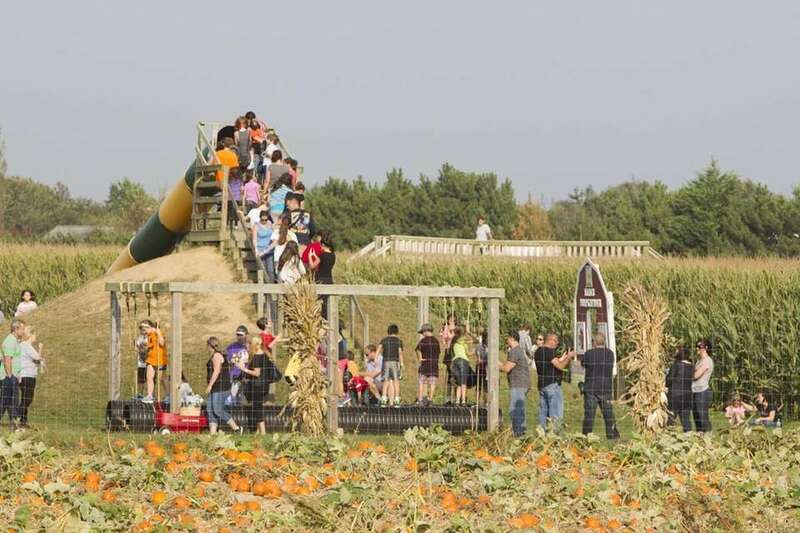 The family festival includes pumpkin-picking, hayrides, an animal train ride, a pumpkin bounce house, a firetruck slide, haunted maze, a John Deere trike play area, duck races, roasted corn, apple cider and more. Price: Free admission, some fees may apply; schmittsfamilyfarms.com. Take a stroll through a batty maze and encounter some goofy creatures, bewitching tricks and ghoulish delights at the "Not So Scary" Adventure for Kids at Gateway Playhouse (215 South Country Rd.) in Bellport. A cheerful guide accompanies groups through a well-lit tour with treats at the end. The event takes place Saturdays and Sundays starting Oct. 5 through Oct. 28, from noon to 4 p.m. Face-painting, balloons, a pumpkin bouncer and more are included. Price: Check website; gatewayplayhouse.org. The Pumpkin Park at Adventureland (2245 Broad Hollow Rd.) in Farmingdale will take place on Oct. 20-21 from 11 a.m. to 5 p.m. Guests are encouraged to dress up and trick-or-treat at vendors set up throughout the park. Adventureland is also hosting a food drive and are encouraging guests to bring non-perishable food items. Pumpkin Park entrance is free, fee for rides; adventureland.us.